Note: monitors defined on this page are used in corresponding application templates. It is recommended to create instances of such templates to monitor VM hosts and guests. For example, there is a Hyper-V Hypervisor template that defines several Hyper-V Host monitors allowing to check all aspects of a Hyper-V hypervisor host. There are also application templates allowing to monitor Xen Server host, virtual machines, and storage repositories. They are implemented as Python scripts invoked over SSH on Xen Server host rather than specific monitors. Therefore they are not documented here. Each Xen template wraps corresponding script by creating several monitors with different arguments. Similarly, there are KVM Hypervisor and KVM Guest Machine templates implemented as shell scripts invoked over SSH. All such scripts may be found under the ‘scripts’ subdirectory of IPHost Monitor installation directory. Guest CPU Usage shows the percentage of time spent by CPU on guest virtual machines. Hypervisor CPU Usage shows the percentage of time spent by CPU on hypervisor. Total CPU Usage shows the percentage of time spent by CPU in total on guest machines and hypervisor. 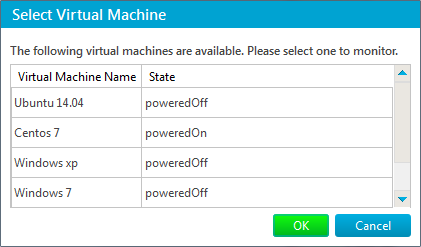 VMs in critical states shows the number of guest machines which are in critical state. Deposited pages shows the number of pages deposited into the root partition. Authentication – has the same meaning as the similar WMI Monitor parameter. Note: If you change the name of a virtual machine in Hyper-V Manager you won’t have to change the value of this parameter. But in case you want to change it you’ll have to do this by clicking the Select button so that IPHost Network Monitor can reload information about virtual machines. Uptime shows the number of hours the virtual machine has been running. CPU Load shows the current processor usage of the virtual system. Available Memory shows the percentage of the current memory available to the virtual machine as the ratio between the memory available to the virtual machine and the total physical memory assigned to the virtual machine. When a virtual machine has no available memory, this value will be negative, and it will contain the ratio of memory needed for the virtual machine to the total physical memory assigned to the virtual machine. If dynamic memory is not enabled for the virtual machine then this value is invalid. Memory Demand shows actual amount of memory that is used by the virtual machine. Assigned Memory shows the amount of memory that has been assigned to the virtual machine by the hypervisor. Authentication – has the same meaning as the identical WMI Monitor parameter. Error count shows the total number of errors that have occurred on the virtual storage device. Read bytes/sec shows the average speed with which data is being read from the virtual storage device. Total Bytes Read shows the amount of data that have been read from the virtual storage device. Write bytes/sec shows the average speed with which data is being written to the virtual storage device. Total Bytes Written shows the amount of data that have been written to the virtual storage device. Note: The performance history will be deleted when you click Save button. So if you clicked Yes in confirmation dialog you still can prevent deleting of performance history either by manually restoring the value of the parameter or by clicking the Cancel button. If Measure parameter is set to Total Read or Total Written then you can specify units of measurement and the time period to store the data about read and write operations. For measurement units you can choose from kilobytes, megabytes, and gigabytes. The time period can be specified the same way as for WMI Traffic Volume Monitor. Authentication – has the same meaning as the identcal WMI Monitor parameter. Note: The performance history will be deleted when you click Save button. So the same way as with Hyper-V Virtual Storage Monitor if you clicked Yes in confirmation dialog you still can prevent deleting of performance history either by manually restoring the value of the parameter or by clicking the Cancel button. The and show it as parameter allows you to set the units of measurement. You can choose from Kbits/sec and Mbits/sec for Speed and from kilobytes, megabytes, and gigabytes for Volume. 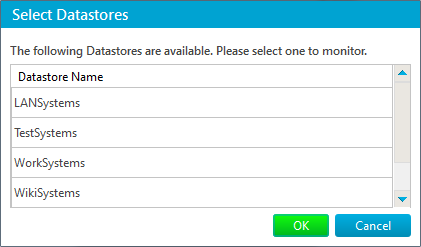 If monitor parameters is set to show traffic volume then you can specify the time period to store traffic data. It can be done the same way as for WMI Traffic Volume Monitor. Authentication – this monitor uses the Unix-like credentials selected in the Credentials section to access the VMware ESXi.